Better known as Boyle against Bentley, this book represents a collective effort to discredit the King’s Librarian, Richard Bentley. 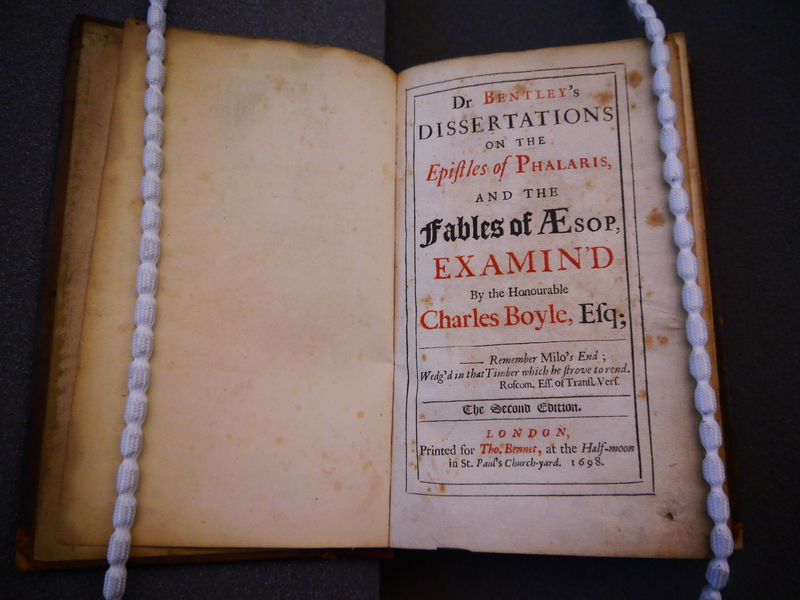 Bentley had had the audacity to criticize Charles Boyle’s edition of the ancient Greek ‘Epistles of Phalaris’, stating that Boyle had lacked the scholarly nous to realise that the epistles were fake. Bentley’s close textual examination left little room for rebuttal, so Boyle, abetted by a group of associates, relied instead on a witty, personal demolition of Bentley and his methods. Thus, the historian Thomas Macaulay described Boyle against Bentley as ‘the best book ever written by any man on the wrong side of a question of which he was profoundly ignorant’. One section mimics Bentley’s original attack, suggesting that, should critics in the far-off future ever chance to read it (‘which I am far from thinking they will’), they will look at Bentley’s tedious and technical writing style and conclude that it can’t have been composed by an Englishman, but must be the work of a later impostor. 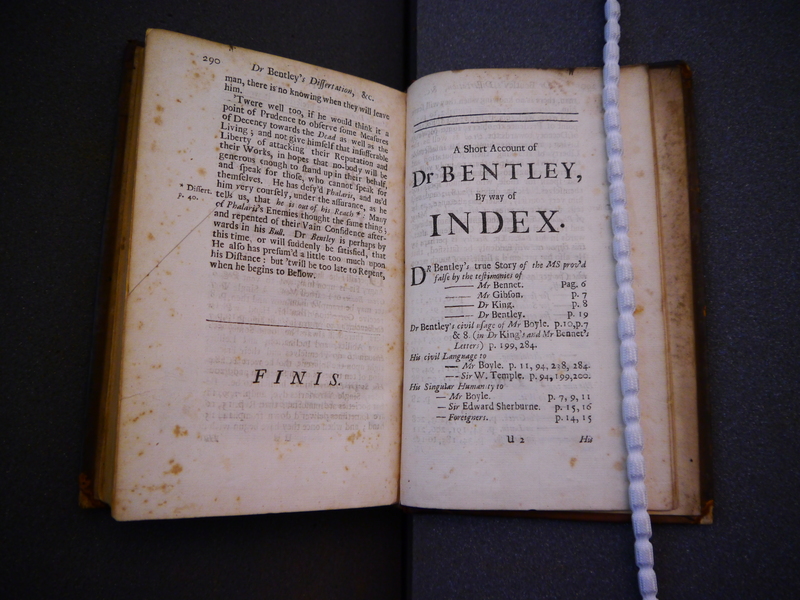 The book ends with its pièce de résistance, a four page index of Bentley’s characteristics with page references should one wish to discover more. For example, ‘His Egregious Dulness, p. 74, 106, 119, 135, 136, 137, 241’, ‘His Collection of Asinine Proverbs, p. 220’, or indeed ‘His familiar acquaintance with Books that he never saw, p. 76, 98, 115, 232’. These days, Bentley stands vindicated, and the Phalaris letters are universally accepted as much later fakes. Nevertheless, at the time of the controversy, people were not so sure. As Thomas De Quincey puts it, ‘[Boyle against Bentley] was eagerly read – a second edition was immediately demanded, and Bentley was supposed to have been defeated’. Kristine Haugen, Richard Bentley: Poetry and Enlightenment (Cambridge, MA and London: Harvard University Press, 2011), pp. 116-22. Joseph Levine, The Battle of the Books: History and Literature in the Augustan Age (Ithaca, NY and London: Cornell University Press, 1991), p. 63. Marcus Walsh, ‘Swift’s Tale of a Tub and the Mock Book’, in Paddy Bullard and James McLaverty (eds), Jonathan Swift and the Eighteenth-Century Book (Cambridge: Cambridge University Press, 2013), pp. 101-18. This entry was posted in Book of the month, Fellows' Library and tagged Bentley, Boyle, Fellows' Library, index, Orrery, Phalaris letters, Thomas Macaulay. Bookmark the permalink.